There’s nothing like a lazy Sunday morning breakfast, especially when these Light Fluffy Crispy Buttermilk Waffles are being served. I already know what you’re thinking, another buttermilk recipe, really? Well, I apologize in advance…but, in my defense…just look at them. What’s there not to love? Even more spectacular is the taste. I’ve tried buttermilk-less recipes, and I think they all have a noticeable aftertaste. So, you can be sure that if there’s a recipe which calls for buttermilk, it’s immediately placed in my “to do” folder. 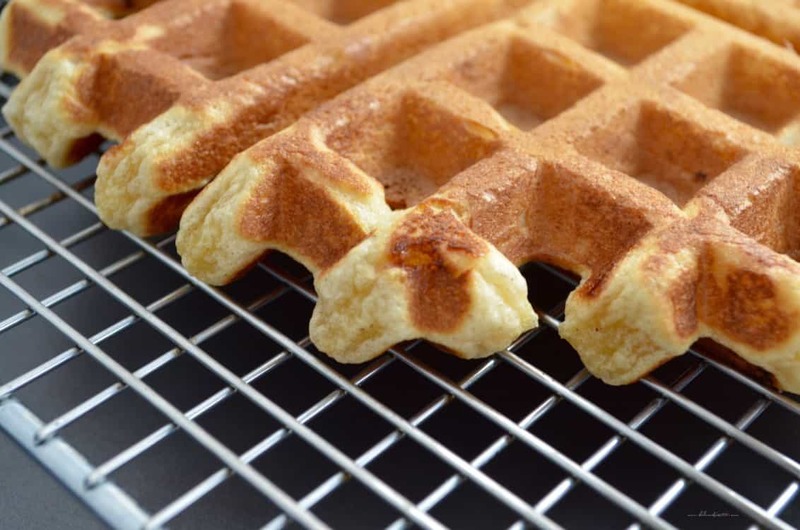 The minute I tried this recipe it became my go-to for light fluffy crispy buttermilk waffles. My upbringing as an Italian-Canadian (sometimes it felt more like a Canadian-Italian) did not include waffles. As a kid, my siblings and I would occasionally have the commercial brand whenever my mom would “give in” to our tantrums (probably watched too many commercials as a kid, I guess). It was only when I became a mother that I was totally grateful to all the times my mom said no to the frozen “Eggo”. Have you ever taken a minute to read the nutritional label of this frozen food? Well, I did and once I began to understand the effects of processed foods on our bodies, I decided on the spot to make an effort to eat healthier. Highly processed usually means a lot of salt, chemicals and harmful fats. You’re looking at this and thinking “I just don’t have the time”. Well, that was also my thought process. But you know what, they’re ready in less than 30 minutes. I usually measure the dry ingredients the night before, making the whole process quicker in the morning. They also freeze very well so you can also enjoy them during the week, as a snack or as a light supper. I’ve adapted this recipe from Martha Stewart Living, with one modification. I’ve substituted the butter with vegetable oil. On occasion, I’ve also replaced up to half the amount of all purpose flour with whole wheat flour- depending who I’m making it for. I love to serve these light fluffy crispy buttermilk waffles with lots of fruit and a dusting of powdered sugar. How do you like to top off your waffles? I love to serve these light fluffy crispy buttermilk waffles with lots of fruit and a generous dusting of powdered sugar. How do you top off your waffles? In a large mixing bowl, sift together dry ingredients. Whisk in the brown sugar. Set aside. In another bowl, whisk together egg yolks,oil,buttermilk,and vanilla. Gently combine with dry mixture. In a medium mixing bowl, beat egg whites until stiff. Gently fold the egg whites to batter. Heat waffle iron. Spray with non-stick spray. Pour about 1/4 - 1/3 cup for each waffle. (I use a large serving ladle and drop the batter in the middle of the waffle iron). Cook 2-3 minutes or until golden brown. Place on a rimmed baking sheet and transfer to oven to keep warm (set oven to 200℉/93℃). Serve with your favourite toppings. You can replace up to 1 cup of the all purpose flour with whole wheat flour. LOVE THIS POST? PIN IT TO YOUR BREAKFAST BOARD! My grandpa says that these are his favorite waffles now. Best in his life. I also agree! The waffles are crispy and light. Very tasty! 10/10 will make again. Great recipe! I substituted a gluten free cup for cup flour and they came out tender on the inside, crunchy on the out. If you are gluten free and can somehow get an ironclad waffle maker, you will have great waffle success. I found mine on Craigslist! I made them today and my family loved it! This recipe is what I’ve been looking for! Thanks! Lazy Sunday mornings are great for waffles! So glad you enjoyed the recipe! Thanks so much for taking the time to comment Karen 🙂 Have a great day! I MADE THESE FOR BREAKFAST THIS MORNING & WE LOVED THEM. PUT THEM IN THE OVEN AS RECOMENDED & THEY WERE PERFECTLY CRISP WHEN I FINISHED COOKING & WE SAT DOWN TO EAT. I FROZE TWO THAT WERE LEFT & WE’RE PLANNING A WAFFLE ICECREAM SANDWICH LATER TONIGHT FOR DESSERT. YUM! THANK YOU MARIA, ANOTHER GREAT RECIPE !!! My pleasure Pat ♥ Saturday mornings are just perfect for waffles 🙂 Thanks so much for taking the time to comment, really appreciate it! Have a great week-end!